Yes, it’s been a while since we’ve posted. The reason? Clive and I have been working hard on the Speakeasy. Here’s the first fruit of our labours. 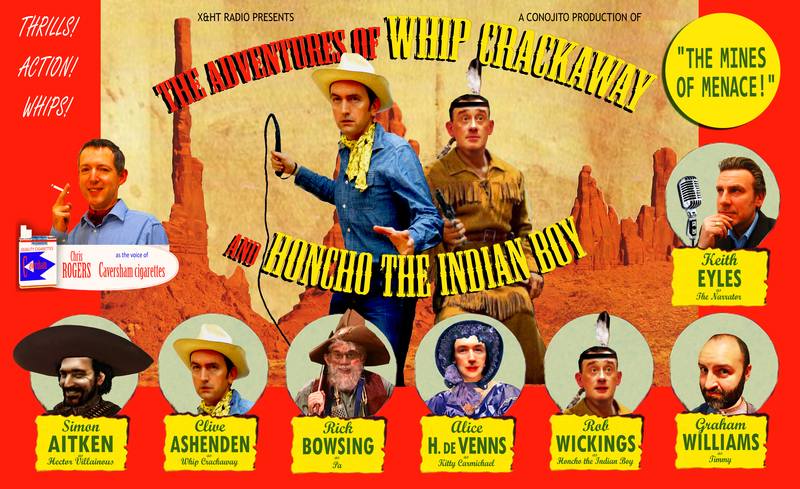 THE ADVENTURES OF WHIP CRACKAWAY AND HONCHO THE INDIAN BOY. Ask nicely, and we’ll never do it again. and Chris Rogers as The Voice Of Caversham Cigarettes. The narrator is Kyle Eddley, who appears with the kind permission of Keith Eyles. The show was written and directed by Rob Wickings, with production and sound design from our friends at All Hallows Post in Reading–‘the finest sound available anywhere’. Poster design by courtesy of Ashenden Arts. Retro LadyLand: First class cult! I wanted to push a site that I’ve been a fan of for a while. If you like cult movies and TV, you’ll dig this too. Retro Ladyland is the brainchild of Charlotte Cooper, an old friend of mine. She runs a vintage shop, Missy Lil’s, and writes for vintage fashion magazines. But she’s a big movie buff, and has poured her passions into Retro LadyLand. She’s managed to snag exclusive and slightly twisted interviews with all sorts of interesting figures from the world of cult and trash film and TV, making the site a bit of a must-read if the notion of reading exclusive interviews with Heather Langenkamp or Betsy Baker floats your boat. I caught up with Charlotte recently and asked her to explain herself. How did you come up with the notion for Retro LadyLand? I have always been a celebrifile (I have just invented that word) and thought, lets try and contact someone and interview them and to my amazement the first person I asked said yes! Then I thought about the format, something that would make my interviews ‘stand out’. I had never written fan fiction before, but knew the market was vast, so I thought, why not incorporate both? An interview with a back story and viola, Retro LadyLand (Two capital L’s) was born. What’s the philosophy behind the site. Or rather, to put it in a slightly less wanky way, what is Retro LadyLand designed to do? I see it like your favourite band singing all your favourite hits at a concert, instead of going to see a band and them playing their new album, which you don’t know and frankly aren’t there for (I think we can all relate to that). In the majority of my interviews, although I do skim over the more up to date aspects of their career (as in Adrienne Barbeau talking about her time in Argo), I like to concentrate on why we love them, their heyday… How we remember them. But most importantly, Retro LadyLand is designed to entertain. You’ve snagged some great interviews with some amazing figures. How on earth did you get hold of them? I just e-mail them, politely and sincerely and once I got one ‘biggy’, they all started to say yes… Although the Krankies asked for money!!! 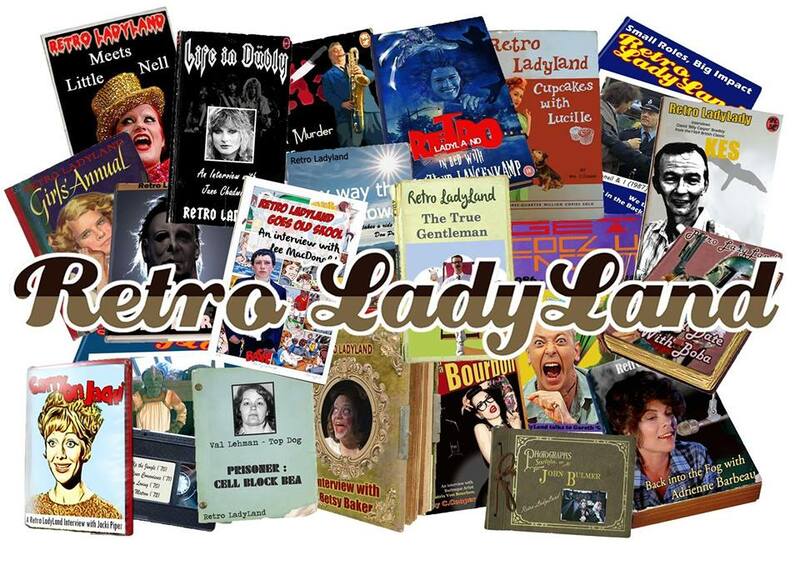 What’s the favourite interview you’ve done for Retro LadyLand? My favourite is hard, as they are all such lovely people. Listening to Shani Wallis talk about Sinatra, Liberace and Garland was a rush and Heather Langenkamp was a teenage hero of mine. But I think it has to be David Bradley (Kes). He was so lovely and sincere and was so young when he played Billy, but still loves to talk about his time filming with Ken Loach, plus it is also one of my all time favourite films. We love spoilers here at Excuses And Half Truths. So, are there any upcoming treats you can let us know about? I have a festive treat for our Christmas special: an interview with Eileen Dietz. Now horror fans will know that name straight away, but if not, she was the Pazuzu, the devil in The Exorcist. The face that gives you nightmares! Also coming up we have Dana Barron, who was the first Audrey in the Vacation movies and I’m very excited about Nancy ‘Robocop’ Allen, coming soon too! Happy reading! Well, that’s a sack full of goodies. Retro LadyLand is a solid read, and full of interesting material for those of us that love a bit of cult. Thanks to Charlotte for chatting to us. Check out the site, and say hi. Tell ’em I sent ya. RETRO LADYLAND THIS WAY>>> CLICK on MICHAEL MYERS FOR ALL THE GOODIES! Posted on December 20, 2013 December 17, 2013 Categories Blog, Film, Geek Alert, horror, tellyTags cult, Film, horror, retro, tellyLeave a comment on Retro LadyLand: First class cult!